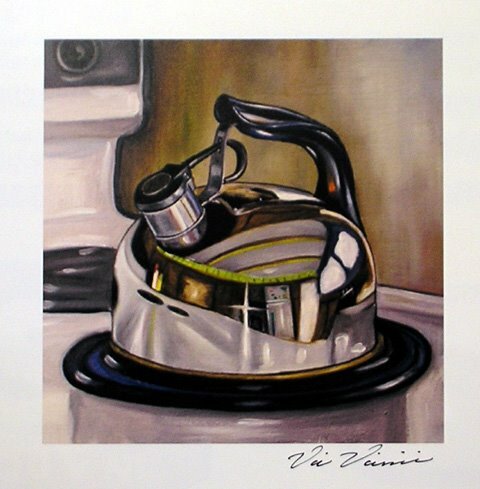 Vic Vicini is an American artist (see more of his work on this website and on this and this blog) who paints primarily still life, with exquisite realistic detail. 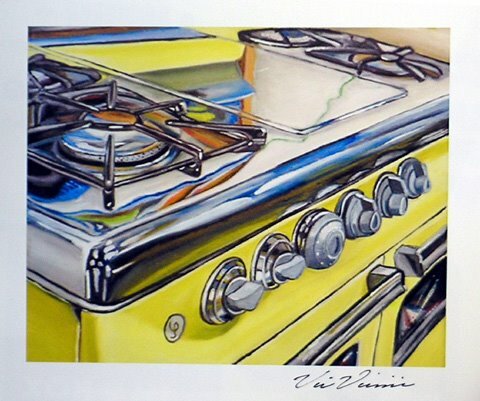 His subjects include kitchen utensils and appliances, food, florals and cars, among others. Studying his paintings one comes to a realization that the artist harbors a particular fascination with reflection: metal objects of all sorts trap light and mirror the ambiance; they are so deliciously bright and shiny that a comparison to a crystal ball (especially with the round shaped kettles and pots) sneaks into the viewer’s mind — implying a clairvoyance of the simple kind, that of a dedicated homemaker doing his or her magic in the kitchen. But it is not the future, rather the distant past that the kitchenware evokes so uncannily. Fire and water as elements underlie the cozy scenes: the stove as the source of heat and the metallic containers as a supply of the life bearing liquid. The kitchen is nothing but a modern cave, with close at hand facilities and separate sources of light and heat. Either you marvel at the displayed cleanliness, or secretly resist it as a not particularly tidy cook, the thought of the infinite fragility of the situation eventually floats to the surface of consciousness, prompting to accept and embrace this idealized part of home as a welcome progress from remote perilous times. Vic’s paintings may also function as illustrations: smooth and cheerful palette bordered by dark contouring positions his artwork comfortably between the two trends. They remind me of old school hand drawn and painted animation, from the fifties, only with more luster and zest. And there is something naive and traditional about them, in the best meaning of these words — a warm reminder of domestic familial comfort. Straightforward and clean compositions entertain the eye without diverting it to unnecessary elaborations, and manifest disarming honesty. This still life is both a celebration of unpretentiousness and an ingenuous indulgence in the abundance of light and color — good life, some would say. However, I would like to return to the reflections, as some of them present an endless source of marvel. Near hallucinatory distortions of line and color will hypnotize the susceptible viewer… well, maybe. Contrary to the common belief that staring at the kettle won’t make it boil quicker, getting lost in these colorful swirls can prove to be an effective time machine, transferring us right to the boiling point. (The click or the whistle terminates the stupor… not to worry). Eventually, in pieces where all of the mentioned qualities intermix particularly harmoniously, reaching a critical mass, the master definition of a “classic” emerges as eminently suitable, many other works being very close to that description. Thank you for the very nice review. I really appreciate it. Well, this is quite amazing… We seem to have a very similar taste — I have already reviewed Mick and Karin last summer, on my old blog! Hmm… I’ll think of something. 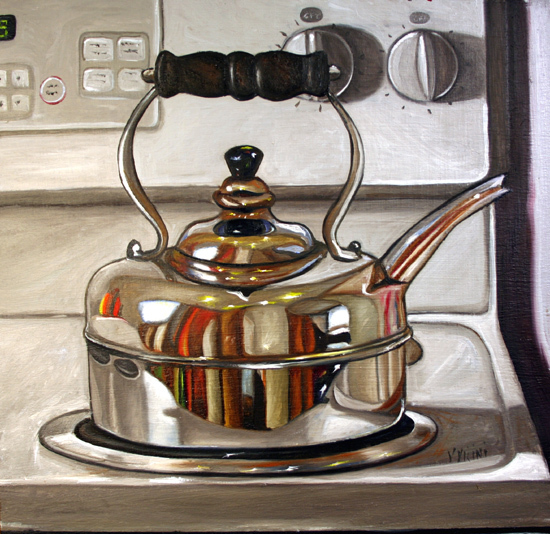 I am looking at some of your food paintings… I can see why restaurants want them on their walls.